In an "unprecedented" attack Monday, a bombing at a popular Bangkok tourist spot left at least 22 people dead and another 123 injured, authorities said. Eight foreigners were among the casualties, including three Chinese, two Hong Kong citizens, two Malaysians, and one person from the Philippines. The photos of the Bangkok bombing show a devastating scene in what is Thailand's deadliest terrorist attack in recent memory. 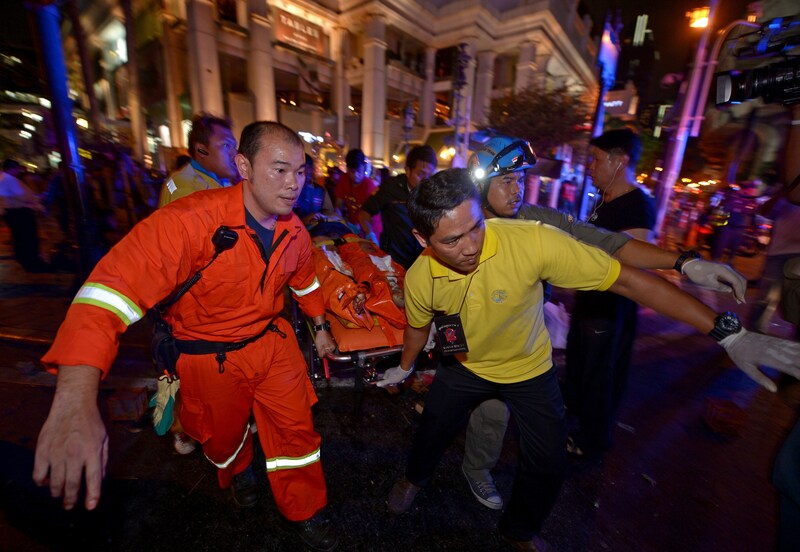 The bomb blasted the heavily dense area surrounding the Erawan Shrine, Thailand's most well-known Hindu shrine, at around 7 p.m., a time when both tourists and locals would be out in the streets. Sanjeev Vyas, a DJ from Mumbai, India, told CNN: "It was like this huge gust of wind and debris flying through you. ... And then I see bodies everywhere, there are cars on fire, there are bikes everywhere. People are screaming." Officials are in pursuit of a suspect who was reportedly caught on security cameras near the bombing site. Prime Minister Prayuth Chan-ocha said the unidentified suspect may have belonged to an anti-government group from the country's northeast region. Though it was too early to determine a possible motive for the attack, the Thai government said the bombing appeared to target the country's tourism economy, which makes up 7 percent of its GDP. While attacks on Bangkok are rare, the last bombing in Thailand's capital came in 2012, when a series of explosions injured four people. According to authorities, the attack was part of a group of Iranian nationals' failed attempt to assassinate Israeli diplomats. A military coup government began running Thailand last May after Prime Minister Yingluck Shinawatra was ousted, spurring violent tension largely in the country's southern region. Regardless of whether Monday's attack was directly related to the country's internal strife, the effects of the bloodless change in power are still felt today. As of early Tuesday, no group had officially taken responsibility for the deadly attack.